In Age-related Macular Degeneration (AMD), the macula is subject to a gradual degeneration process. 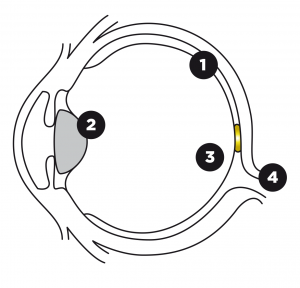 The macula, also known as the yellow spot, is located near the centre of the retina and is responsible for sharp, central vision. It is an oval-shaped, highly pigmented yellow spot and has a diameter of around 6 mm. Because the macula is yellow in colour it absorbs excess blue and ultraviolet light that enter the eye; acting as a natural sunblock for this area of the retina. The yellow colour comes from its content of lutein and zeaxanthin, which are yellow xanthophyll carotenoids, to be obtained from the diet. There is evidence that these carotenoids can protect the pigmented region, the macula, from the development of AMD. Furthermore, the macula contains cone-shaped photoreceptors enabling people to observe details and colours. When the cones in the macula malfunction, AMD may develop. The loss of cones causes a deterioration or loss of vision in the central, detailed visual field. AMD is often called ‘wear’ of the retina.